Batman. A comic book creation that has excited fans for 69 years. As a character, he has endured through the death of his parents and one sidekick. He survived through Fredric Wertham‘s Seduction of the Innocent and the creation of the Comics Code Authority. The campiness of the 60’s television show, a broken back at the hands of Bane and the near destruction of Gotham. All things that in one capacity or another that this fictional character has survived. Every one of these pale in comparison to the maniacal villain that he must face in Nolan’s sequel to the popular Batman Begins. For those who don’t know me, here is a a bit of background which might help show that what I’m about to say is not said lightly. I am a huge movie buff. My DVD collection creeps close to 500. I’m also an avid comic book reader, with my collection exceeding over 10,000 comics and graphic novels. Out of any character that I’ve read over the last few decades, Batman always has and remains my favorite character. There are many reasons for this which I won’t get into right now. Trust me when I say that The Dark Knight is not only the best comic book based movie that I’ve ever seen, but its probably the best movie that I’ve seen of any genre. The Dark Knight takes place a year after Batman Begins. For those who have seen the first film, you might remember that the last scene of the movie involves Gordon and Batman on the rooftop of the GCPD, with Gordon showing Batman the Joker’s calling card. This sequel starts off with a bank robbery sequence in which we’re introduced to the chaos that is the Joker. From the gutters of Gotham rises the psychopathic criminal known for his evil grin, maniacal laugh and utter disrespect for everything and everyone.We’re also introduced to Harvey Dent, the District Attorney who, together with Jim Gordon and Batman, is taking the good fight to the city’s mob bosses. The appearance of the Joker slams a stake deep into our heroes’ plan to rid the city of mobsters. It also forces Bruce Wayne/Batman to struggle and confront everything he believes in. Unlike other criminals, the Joker isn’t seeking money or fame. His only goal is to unleash pure unalduterated chaos unto the citizens of Gotham. Calls to give Heath Ledger a posthumous Academy award for his work in the Dark Knight is not uncalled for. His portrayal of the Joker is nothing short of perfection. Everything from his mannerisms, ticks and speech drip insanity without going over the top. Watching him play this character will leave you absolutely speechless and in awe. It is a real shame that this would be his last full role in a movie, as we can clearly see how much of an extraordinary actor he really was. Its also a shame that he won’t be involved in any possible sequels. 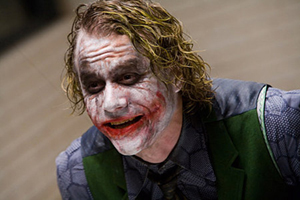 There’s no way any actor out there could try to successfully imitate what Ledger brought to the character. The performance by Aaron Eckhart as Harvey Dent is also a powerful one. He brilliantly played the DA who throughout the movie is built into a white knight in shining armor, and who falls far from that position when he is turned into Two-Face. Gary Oldman, as detective/commissioner Gordon plays a much more important role in this sequel. His acting skills are on par with any other movie that he’s done, which is to say it’s very very good. Maggie Gyllenhaal, who replaces Katie Holmes in the role of Rachel Dawes, plays the character well. And then there’s Christian Bale. He gives a good performance as Bruce Wayne/Batman, but this isn’t as much of a Batman movie as it is a Joker/Dent movie. Yes, the Batman plays a major role, but there is little character development compared to Batman Begins. There’s nothing really wrong with this as the character of Wayne/Batman was already well established. The only fault I have with Bale is the voice he uses when he’s wearing the Batman garb. It seemed forced and a little over the top. Visually, The Dark Knight is dead on. The darkness of the characters and the story visually permeates the movie. Even though Batman and Joker are fictional characters, and previous incarnations made them larger than life, as with Batman Begins, Nolan has grounded the Dark Knight into reality. Nothing is too over the top or too fictional. I do think part of the attraction to both of Nolan’s works is its authenticity. These characters are believable and could very well exist in the modern world. A quick note to parents; If you haven’t caught on yet, this is a very dark movie. Just because its a comic book character does not mean its OK for your 8-10 year old. I wouldn’t recommend that anyone under the age of 14 see this flick due to its nature. Spiderman or Iron Man this movie is not. The Dark Knight is far more than just a comic book movie. It reaches deep within the human soul and splatters the duality that most people have faced at some point in their lives right onto the screen. It clearly shows that chaos and order live hand in hand. The Joker being the Yin to Batman’s Yang. Without one, the other cannot exist. It also illustrates that there’s a fine line of moraility that most of us abide by, and makes you ponder what could make you cross that line. What would cause you to cross the threshold? I give The Dark Knight 10/10, a rating that I’ve never given to any other movie. Sat July 19th 11:55am: The Dark Knight has racked in over $66.4 million on Friday, breaking the 1 day record previously held by Spiderman 3 ($59.6 million). TDK is also currently ranked #3 in IMDB’s top 250 movies of all time as voted by fans.